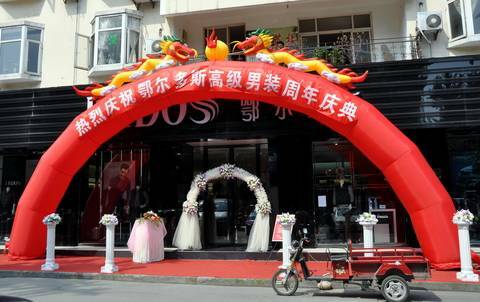 A giant inflated red plastic arch topped by two colourful dragons is used to mark the opening of a new business in Pengzhou, China (© 2011 Lee Snider | Dreamstime.com). At the late August meeting of the Association for the Sociology of Religion in Denver, Colorado, two scholars focused on how Muslim- and Buddhist-owned businesses have opened up new spaces for religious practice and identity. A paper by Yuting Wang (American University of Sharjah in the United Arab Emirates) looked at the mushrooming Muslim businesses in urban China, interviewing 65 Muslim businesspeople in five cities across the country. She said that Islam in urban China has been contained within the boundaries of ethnic Hui quarters, perpetuating the foreignness of Islam in the eyes of the Han Chinese majority. But in recent decades these enclaves are being converted into business districts, drawing rural Muslims in search of business opportunities. These newcomers are “bringing new vitality into urban religious life,” Wang said. These enclaves are “using ethnicity as a cover even if religious activities take place,” she said. The Muslim businesses are playing an important role in “expanding the traditional Islamic space in urban China.” Because the social policy limiting families to one child does not apply to the ethnic communities, Muslims can have more children, thus making these business enclaves larger and more attractive to Muslims outside of them. Businesses also are playing a new and important role in expanding Buddhism in China’s cities, according to Weishan Huang of the Max Planck Institute for the Study of Religious and Ethnic Diversity in Germany. Huang looked at the Tzu Chi movement, a humanitarian Buddhist group based in Taiwan but with a growing global membership of millions. The movement spread in China through transnational links of Taiwanese investors and business professionals who started companies in cities such as Shanghai. The increased indigenization of membership has been rapid. Most of the new converts are Chinese. The religious teaching has translated into grassroots education on social issues among Chinese and street campaigns. Huang said that after gaining their legal recognition in 2008, members of Tzu Chi in China have in some cases worked side-by-side with the local governments on relief efforts. But even after given “legal” status, they still have to practice their belief in a hidden way, often within small groups. In her research in Shanghai, Huang finds that municipal regulations forced Tzu Chi missions from home-based meetings into the business sectors-the companies and manufacturers that are dominated by foreign investors, even if their practices are not categorized as illegal activities. In one case, Huang found a storefront space that had been converted into a gathering place for all Tzu Chi activities in that district in Shanghai. After being told there was no public religious display besides tourism sites in Shanghai, “I walked into [a member’s office] and was greeted by Tzu Chi posters as her storefront decoration. The office is completely converted into a Tzu Chi local center with clear Tzu Chi interior design elements. Every Tuesday, there is study group gathering in this commercial space. Members watch video clips and listen to senior commissioners’ lectures about environmentalism and Buddhism,” she added. In another paper, Graeme Lang of City University of Hong Kong argued that even with government restrictions competition is also driving religious growth in China. Lang has researched how Buddhist temples compete with each other, with the most successful ones being managed by secular entrepreneurs rather than monks. Lang and his co-author Kim-kwong Chang find that the success and innovations of evangelical Protestants are leading other religious and even communist groups to borrow some of their practices. The Protestants, who are growing the fastest among China’s religious groups, are known for their creativity and independent approach that can reach a segmented population, as well as their involvement in social services. Buddhist temples have borrowed some of these evangelical practices, such as holding summer camps and featuring brief Buddhist teaching sessions that are similar to the evangelism carried out at Protestant church cafes. Catholics have likewise adopted Protestant techniques, such as singing Christmas carols in the streets and passing out evangelistic tracts. Lang said that even Muslims, particularly those outside of ethnic communities, fear losing members to Protestant churches and have sought to learn from Christians. A delegation of mullahs have visited Protestant churches seeking to learn about their practices. Other Muslims have borrowed their segmented approach, using advertising and music in the attempt to keep their youth in the fold. Lang said he was most surprised how other ideological groups such as the Communist Youth League have likewise sought to borrow from the Protestants in their use of study groups and summer camps.